ATTRIBUTES: Jasper comes in a variety of colors due to the composite materials found in this silicon dioxide mineral. Jasper is found throughout the world. With it soothing vibrations, Jasper is known as a nurturing crystal that is energetically supportive over the long haul, balancing and grounding on all levels. Jasper balances yin-yang and aligns the physical, emotional, and mental bodies with the etheric realm. Jasper’s grounding energies provides protection and facilitates shamanic journeys and dream recall. 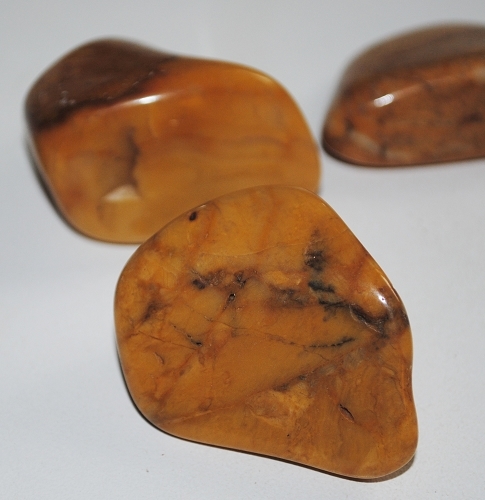 Jasper also stimulates the base chakra encouraging one to follow their passions, creative impulses, and get busy doing whatever contributes to their overall well-being. Jasper lends support to follow through accomplishing goals with persistence and determination. 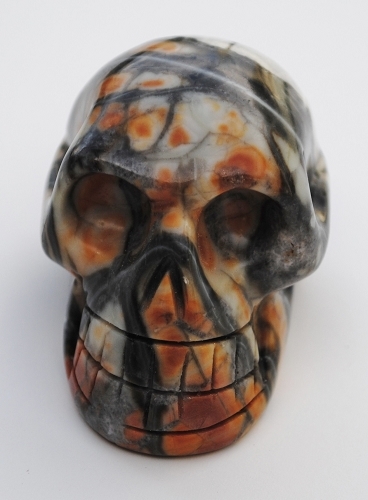 Jasper helps one face challenges and perceived problems with integrity and courage. Jasper clears electromagnetic and environmental pollution, including radiation and aids dowsing. HEALING: Jasper aligns the chakras and may be used in chakra layouts with each color for a specific chakra. Jasper supports the circulatory, digestive, and sexual organs. Jasper balances the mineral content of the body and may be useful as gem elixir, as it does not over stimulate the body. Jasper is a helpful crystal tool for re-energizing the physical body and may be used for long periods of time. BLUE JASPER connects to the spirit world, stimulates the throat chakra, balances yin-yang energy, and stabilizes the aura. Blue Jasper may sustain energy levels during periods of fasting. Blue Jasper may also be helpful in the healing from degenerative diseases and balancing mineral deficiencies. When placed on the Navel and Heart chakras, Blue Jasper is supportive for astral travel. BROWN JASPER is connected to the Earth encourages ecological awareness creating stability and balance in the environment. Brown Jasper facilitates deep meditation, centering, and regression to past lives, revealing karmic causes. Brown Jasper may be helpful in improving night vision and is supportive for astral travel. Brown Jasper boosts the immune system, clears pollutants and toxins from the body. Brown Jasper is also stimulating and cleansing to organs, heals the skin, and strengthens the resolve to give up smoking. SPIDER WEB JASPER is also known as Pegratite named after Phil Pegra who originally discovered this Rhyolite-type jasper in the 1960’s. Spider web Jasper encompassing feminine energies supports creative power. Spider Web Jasper reminds us of the connection and responsibility we have for each other. Spider Web Jasper allows for a wider viewpoint and gives the understanding and importance of current actions. Spider web jasper is a manifestation stone supporting the knowledge that everything you create now is weaving what you will encounter in the future. GREEN JASPER heals and releases diseases and obsessions. 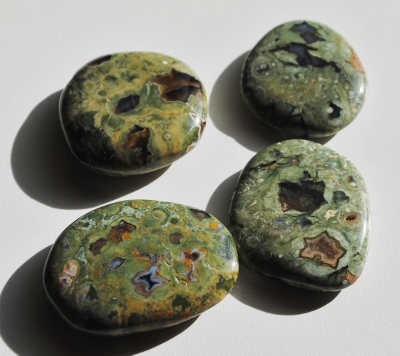 Green Jasper helps one create and maintain personal boundaries. Green Jasper stimulates the heart chakra. Green Jasper may be helpful in the treatment of allergies. Green Jasper heals ailments of the upper torso, the digestive tract and reduces toxicity and inflammation. DRAGON SCALE JASPER displays patterning reminiscent of reptilian and serpentine dragon skin. The legend of the Dragon is found in cultures all over the world. Dragons are thought of as mythical beings having magical powers and are associated with wisdom, fearlessness, protection, and flexibility. Dragons were thought to be guardians of the element of water. Dragon scale jasper energies nurture and balance while re-energizing the physical body. Dragon scale jasper brings about physical as well as spiritual well-being and strength. Dragon scale jasper brings to the surface hidden feelings of guilt, envy, hatred, love, and thoughts that are normally pushed aside, whether from the present or past lives. Dragon scale jasper brings comfort and alleviates fear. Dragon scale jasper offers an energetic armor that allows for flexibility, comfort, and protection. Dragon scale jasper lends energetic support to follow through accomplishing goals with persistence and determination. Dragon scale Jasper resonates with auspiciousness and new beginnings. 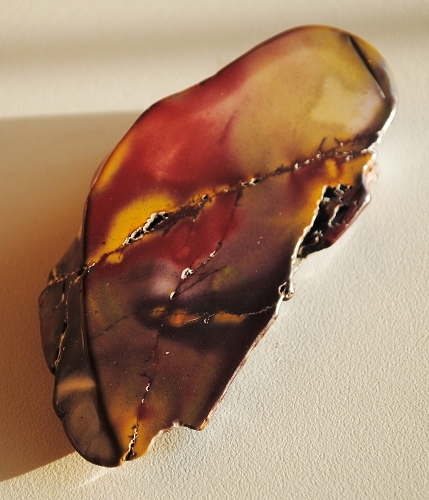 Dragon scale Jasper helps one face challenges and perceived problems with integrity and courage. In healing, Dragon scale jasper may be helpful in the treatment for disorders of the skin and for supporting healthy kidney, bladder, and circulatory functions. RED JASPER is a powerful stabilizing stone creating balance and well-being. Red Jasper enhances endurance and stamina. Over time, Red Jasper may increase life force energies and strengthen the grounding connection between the earth and the root chakra. Red Jasper stimulates the base chakras and may be a helpful crystal tool for re-birthing and regression therapies. Red Jasper clears and activates the chakras strengthening them in preparation for the rise of kundalini energies. Red Jasper activates sexual energies and creative manifesting forces. 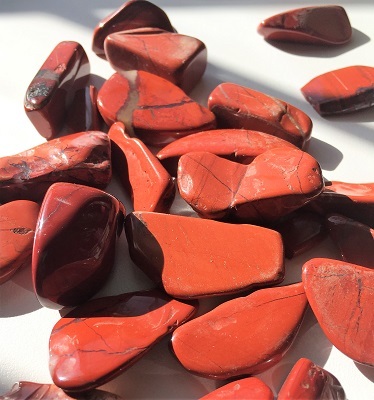 Red Jasper brings problems to light before they become too big and provides insight to the most difficult situations, an excellent worry stone, calming the emotions. Red Jasper helps dream recall and memory. In healing, Red Jasper cleans and stabilizes the aura and is a stone of health, strengthening and detoxifying the circulatory system, the blood and liver. Red Jasper may be helpful in dissolving blockages in the liver or bile ducts. YELLOW JASPER protects during spiritual work and physical travel. Yellow Jasper stimulates the solar plexus and channels positive energy. Yellow Jasper releases toxins and promotes healthy digestion and is helpful for stomach issues. BLACK JASPER is also known as BASANITE. Black Jasper is one of the best grounding stones found in the crystal world. 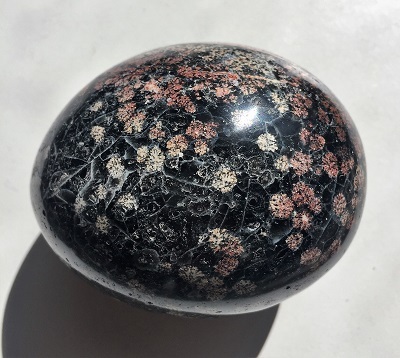 Black jasper is thought to be nurturing, transforming and provides energetic space for self-understanding, prophetic dreams and future visions. Black Jasper’s grounding energies provides protection and facilitates shamanic journeys and dream recall. 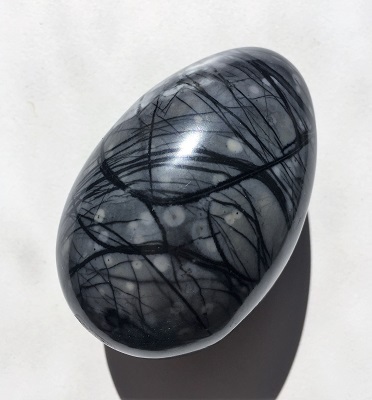 Black Jasper may help you identify and move through energetic blockages caused by feelings of self-doubt, inertia, helplessness, and confusion. 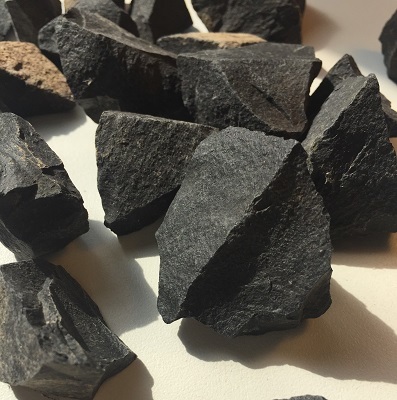 Black Jasper’s energetic vibrations support the understanding and importance of patience and perseverance, as we methodically move through denser energetic states on our pathway of growth and life experiences. Black Jasper helps one face challenges and perceived problems with integrity and courage. In healing, Black Jasper may be helpful in the treatment of exhaustion and depression. MOOKAITE (AUSTRALIAN JASPER) provides a useful balance between inner and outer experiences fostering a desire for new experiences with a calming "present" energy. Mookaite Jasper encourages versatility, points out all possibilities and assists in choosing the right one. Mookaite Jasper assists one with the “knowing” of the right decision or path to take. Mookaite Jasper resonates with the Earth’s electromagnetic energy currents and channels the vibration to maximize the effects of one’s will and personal power. Mookaite Jasper is helpful to those who would like to practice animal communication as this stone brings awareness to our instincts and animal “knowing.” Mookaite Jasper is supportive for those who are feeling lonely or are bereaved. Mookaite Jasper helps to slow physical aging processes by raising the vibration of one’s body and thoughts. Mookaite Jasper helps to identify one’s own beliefs about aging – positive thoughts and a “young at heart” attitude about aging slow down the aging process.Mookaite Jasper helps one to understand and release emotional and behavioral patterns that have been handed down from one’s family history. Mookaite Jasper is a physically stabilizing stone that fortifies the immune system, heals wounds and purifies the blood. Mookaite Jasper supports reproduction, pregnancy, and the regeneration of the physical body. PICTURE JASPER is a divination crystal tool containing messages within its pictured and patterned surfaces for those who can read it. Picture Jasper brings to the surface hidden feelings of guilt, envy, hatred, love, and thoughts that are normally pushed aside, whether from the present or past lives. Picture Jasper brings comfort and alleviates fear. Picture Jasper stimulates the immune system and cleanses the kidneys. OCEAN ORBICULAR JASPER is also called the “Atlantis Stone” as it is said to be connected to Atlantis. Orbicular Jasper is beautiful to observe with its orbs patterning ranging from small dots or spherules to larger bands of circular design. Ocean Jasper symbolizes the interconnections of all and encourages and supports the pursuit of service to ALL. 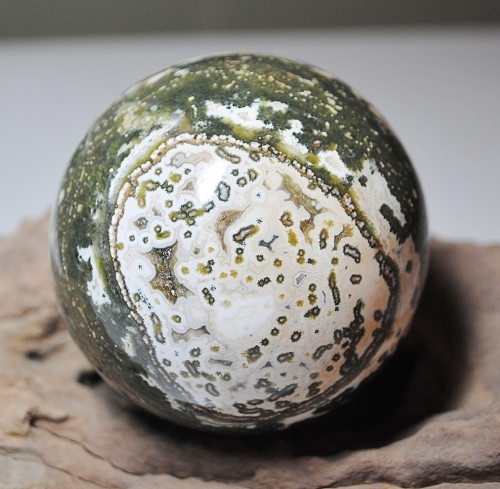 Ocean Jasper reminds one of the cyclical nature and flow of life. Ocean Jasper is gentle and nurturing and helps one remain patient and fluid when coping with changes. Ocean Jasper may be helpful for those who suffer from depression gently bringing focus to the positive and joyful aspects of life. Ocean Jasper helps one to see and appreciate the many blessings in life. Ocean Jasper facilitates the surfacing of unresolved emotional issues and helps one to accept responsibility for your actions. Ocean Jasper may be helpful to those who want to overcome self-destructive behavior. 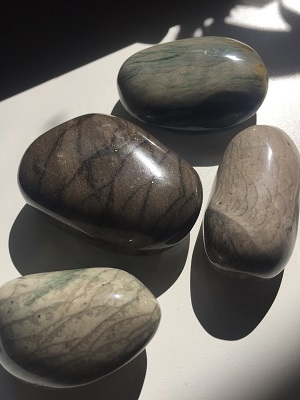 Ocean Jasper’s healing vibrations facilitate a positive shift in behavior patterns that may have otherwise manifested into disease of self or the environment. Ocean Jasper stimulates the solar-plexus, heart, and throat chakras so one may feel, speak and act with good intentions and positive results. Ocean Jasper helps to release stress, alleviate future worries and escapism bringing attention to the present moment. Ocean Jasper is a soothing and centering stone. In healing, Ocean Orbicular Jasper may be used to affect nutritional stabilization within the body and to improve digestive processes. Ocean Jasper may help to assist in the elimination of toxins, body odor and dis-ease. Ocean Jasper supports the regeneration of tissues in the body and the healing of organs while balancing the glandular system. Ocean Jasper may be beneficial in stabilizing thyroid and balancing the adrenals and endocrine system. ROYAL PLUM JASPER opens the crown chakra and aligns the spiritual energies to personal purpose, bringing status and power. Royal Plum Jasper eliminates contradictions, supports preserving one's dignity and brings emotional/mental stability. BRECCIATED JASPER is veined with Hematite making this mineral an excellent aid for keeping your feet on the ground and attaining emotional stability. Brecciated Jasper draws excess energy away from the head which in turn helps to promote mental clarity. Brecciated Jasper helps to provides insight to the most difficult situations bringing problems to light before they become seemly too big. 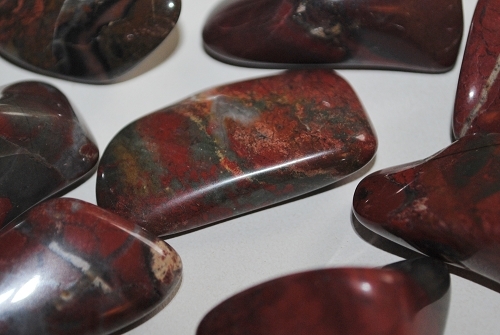 Brecciated Jasper is an excellent worry stone as it helps to calm the emotions. Brecciated Jasper stimulates, as well as, balances the base chakras. Brecciated Jasper cleans and stabilizes the aura. Jasper balances yin-yang and aligns the physical, emotional, and mental bodies with the etheric realm. Jasper clears electromagnetic and environmental pollution. In healing, Brecciated Jasper is a stone of health, strengthening and detoxifying the circulatory system, the blood and liver. Brecciated Jasper may help to dissolve blockages in the liver or bile ducts. TIGER IRON JASPER is a combination of Jasper, Hematite and Tiger's Eye. Tiger Iron Jasper promotes vitality and helps when passing through periods of change, pointing to a place of refuge when danger threatens. Tiger Iron Jasper is extremely helpful to people exhausted from emotional, mental burn-out or suffering from family stress. Tiger Iron Jasper promotes change and supplies energies necessary for action. Tiger Iron Jasper works on the blood, balancing the red-white cell count, eliminates toxins, helps to heal the hips, lower limbs, feet, and strengthening muscles. Tiger Iron Jasper aids assimilation of B vitamins and produces natural steroids. DALMATIAN JASPER is a calming stone that will gently cleanse while energizing your auric field. Dalmatian Jasper also helps to strengthen loyalties within your family and among your friends. Dalmatian Jasper is a great stone for those who are working with animals. Dalmatian Jasper also offers relief from those who suffer from nightmares, negative thinking, and depression. Dalmatian Jasper elevates your mood keeping you relaxed and in good spirits. COBRA JASPER is beautifully colored with sage and forest green markings and swirly patterns. Cobra Jasper is also known as King Cobra Jasper. Cobra Jasper facilitates balance in life. Cobra Jasper may help to heal and release the source of dis-ease and obsessive behavior. Cobra Jasper imparts determination to all pursuits and brings courage to get to grips with problems. 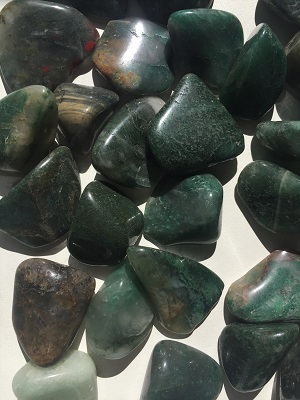 Cobra Jasper stimulates the heart chakra and its calming and nurturing energetic vibrations help to alleviate anger and achieve a level of inner peace. Cobra Jasper provides protection and grounds energies and the body, absorbs negative energy and cleanses and aligns the chakras and the aura. In healing, Cobra Jasper may be helpful in the treatment of skin disorders and intestinal bloating. Cobra Jasper may also help to heal ailments of the upper torso, the digestive tract, as well as, purifying organs including reducing toxicity and inflammation. DESERT BLOOM JASPER, with its soothing vibrations, is known as a nurturing crystal that is energetically supportive over the long haul, balancing and grounding on all levels. Desert Bloom Jasper reminds one they are surrounded by beauty and success even under the harshest circumstances. Desert Bloom Jasper lends support to follow through accomplishing goals with persistence and determination. 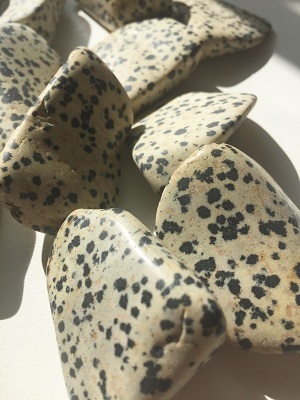 Desert Bloom Jasper’s grounding energies provides protection and encourages one to follow their passions, creative impulses, and get busy doing whatever contributes to their overall well-being. Desert Bloom Jasper is energizing and stimulating catalyzing movement forward and awaken clarity to questions or life situations. Desert Bloom Jasper supports initiative and self-sufficiency by acknowledging and wisely “use what you have” resources available to achieve success Desert Bloom Jasper encourages one to take a time out, seek quiet and introspection, and go on an energetic and/or actual physical vision quest. PICASSO JASPER: Like the artist Pablo Picasso, Picasso Jasper encourages one to be creative and explore a wide variety of styles in life both physically and energetically. Picasso Jasper is a composite of metamorphosed limestone rock of crystallized dolomite or calcite. This combination of materials makes Picasso Jasper visually stimulating with its bold and graphic patterning. Picasso Jasper encourages one to make a splash and paint your life in vibrant colors for all to see. Picasso Jasper also gives one a non-judgmental approach to life, acknowledging all experiences are part of an arc of soul development with the "final” masterpiece still in process. 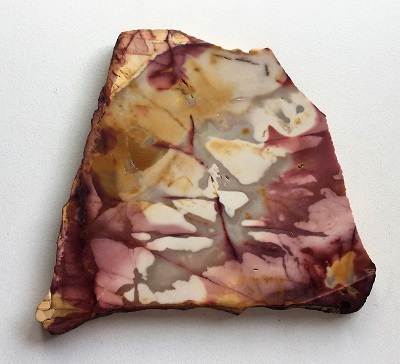 If you mess up, Picasso Jasper lends its supportive energies for a “do over.” A wonderful crystal tool for community endeavors, relationships, or family well-being, Picasso jasper’s nurturing energies brings people together to form loyal, trusting friendships, and long-lasting commitments. Picasso Jasper may be useful for eye problems and supportive for vision health.